I can imagine the face of the Samaritan woman in John 4. You would expect downcast eyes but I think bold, challenging eye contact was her armor. Her face bore the hardness of one unfair day after another. There was a forced beauty about her...evidence that she was an expert at trying hard. I wish I could know her name. I would love to friend her on facebook and then meet up for coffee. She knows secrets about how Jesus wakes up a dry, numb heart. Those are secrets that all of us who mentor and reach out to lives around us need to hear. The first words out of her mouth when Jesus asked her for a drink sound like echoes of the attitudes I've encountered over the years in my small group of high school girls. For every handful of soft, eager learners I always find a girl with a heart like a rock. A girl who makes even an innocent request for a drink a challenge. I imagine the Samaritan woman pointing her finger at Jesus and spitting out the cold, hard truth of her unworthiness before he had a chance to hurt her with it. Jesus continued the conversation with measured, gentle truth. The Samaritan woman kept up her guarded ways while she tried to ascertain what handouts could come from this encounter. Her whole world must have felt like it shifted off kilter when he told her things about her past that she thought were safely locked up. Unexpectedly, everything changed. The armor chinked, the soft heart was laid bare and her deepest need rose to the surface: Redemption. I think she whispered her next words, "Could this be the Christ?" The posturing and protection were over. Now all she could think about was bringing other people to Jesus. Something happened in her heart when she encountered Jesus, it woke up. You could call it an awakening. That's exactly what any leader is hoping to see in the hearts of their people. We minister because we are burdened for hearts and are asking God to use us to show Himself. If you are like me you aren't satisfied with helping people behave better or try harder. What I am desperate to see is hearts that wake up, that ask, "Could this be the Christ? Could Jesus really be the answer?" Hearts that yield, giving way to God's grace and forgiveness. 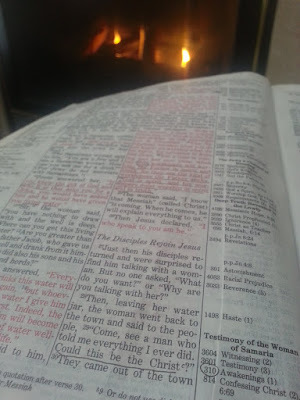 Lives that are radically changed like the Samaritan woman's. My next question is how? How can I pave the way for Jesus' presence and God's grace to get to hearts unencumbered? The Bible speaks a lot to how hearts awaken to the presence of Jesus. Hearts awaken when they see things happen that could only have been God. Does my life show God this way? Have I risked enough in my faith, like Elijah, that others can see things in my life that could only have been God? Hearts awaken when they humbly respond to spiritual leadership. Am I providing spiritual leadership like Hezekiah? Am I offering invitations to obedience that require a response? Most will probably scorn and ridicule, but some will have humble hearts. What if there is a Samaritan woman in my group? Hearts awaken when just one heart responds to God in confession. Confession of sin began among the people when they witnessed Ezra's example. Do I feel the weight of my people's sin as heavy as Ezra did? Am I desperately seeking God on behalf of them? Are they seeing it? Hearts respond when they're faced with their sin and God's wrath. One of the deepest goals of ministry needs to be hearing people ask this question. John the Baptist's message was clear. We are enemies of God, deserving of his wrath because of our sin. True faith requires repentance - a complete turning. Am I unashamedly speaking the truth to hearts, forcing them to face the fact that they are deserving only of God's wrath. Are my words making them desperate for an answer? Have I made it clear that Jesus is the only answer. If people hear nothing else from me, they must hear this. Hearts awaken when they hear about Jesus' power in the lives of those around them. The woman didn't know much about Jesus, but what she did know she told. Her meager testimony was enough to awaken the hearts of those around her. Am I offering tastes of what Jesus can do in a life? The little I have to offer is enough to be used by God to awaken hearts. Jesus is telling us the same thing. He has us in the huddle and is whispering, "Open your eyes and look around you.... I'm getting ready to wake them up, don't miss it!"